International Space Station astronauts Scott Kelly and Timothy Kopra performed a contingency spacewalk to free the stuck Mobile Transporter (MT), which needed to be in a secure position to allow for docking of the Progress MS-1 cargo ship. On Wednesday night, Dec. 16, ground teams commanded the MT to move from Work Site 4 (WS4) to WS2. 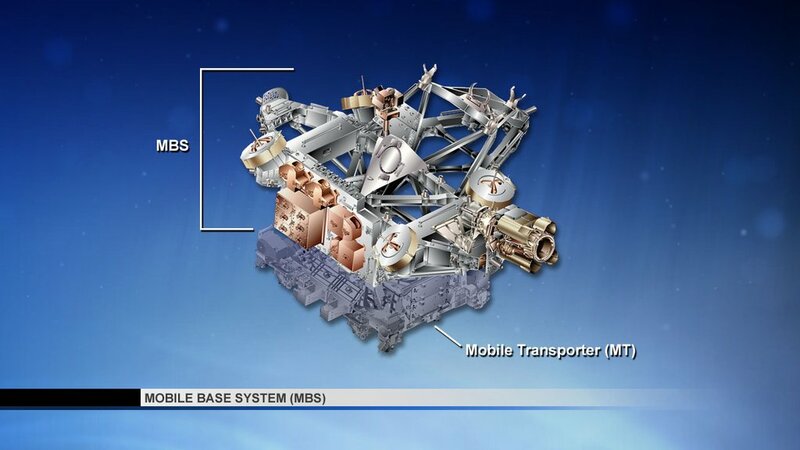 It moves on rails and is able to move 354 feet (108 meters) along the space station’s truss assembly. Moments later, an error forced the cart to stop in a braked but not latched position. Ground teams determined that it was likely a stuck brake on one of the Crew Equipment and Translation Aid (CETA) carts. The station would not be allowed to reorient itself to prepare for docking of the Progress MS-1 spacecraft, which launched early Monday, Dec. 21. The concern was for any potential shifting, either during reorientation or when the Progress ultimately docks to the station. Kelly and Kopra awoke early Monday morning, Dec 21, and began preparing for the Extravehicular Activity (EVA). The crew began with a one-hour pre-breathe session of pure oxygen using masks. Additionally, the pressure was lowered inside the airlock to help facilitate the ingress into the suits. After communication and telemetry checks, the crew began another 100-minute pre-breathe session, this time while inside their suits. Both sessions are designed to help remove nitrogen from their blood, avoiding decompression sickness during the spacewalk. After the hatch was opened, Kelly and Kopra switched their suits to battery power at 6:45 a.m. CST (12:45 GMT), signifying the start of the EVA. Kelly wore the spacesuit with red stripes and was designated as EV1, the lead spacewalker. Kopra was designated EV2 and wore a spacesuit with no stripes. Kelly left the Quest airlock first to set up tethers. Kopra followed soon after. They then made their way to the S0 truss segment, the center truss on the ISS, where the MT was located when it got stuck. The two each went to one of the two CETA carts, currently attached to the MT. Kelly went to the one on the starboard side while Kopra went to the one on the port side. Kelly then attempted to wiggle the starboard CETA cart and noted that it was “rock solid”. He then actuated the brake handles, releasing the brakes. This did the job and the CETA cart was free to move along the MT again. Kopra checked the port CETA cart brakes as a precautionary measure. After that, both crew members moved away to await ground teams to command the MT back to WS4. The astronaut duo reported seeing the transporter in motion and commands were sent to latch it down once it arrived at the worksite. At 7:31 CST (13:31 GMT), good latching was confirmed. Ground teams will not attempt to move the MT to WS2 until later in December, after Progress MS-1 docks with the station. With the main task completed in a little over a half hour, the crew began working on “get ahead” tasks. The first was completed by Kopra at the S0 truss. He opened a Secondary Power Distribution Assembly door on the Mobile Base System (MBS), allowing the Dextre robotic “hand” to access switches and circuit breakers in the future. Task two was to finish tasks leftover from the previous spacewalks. Kopra routed an ethernet cable across the Unity node module to a stowage location near the Zarya module. The cable will eventually be connected to the future Russian Multipurpose Laboratory Module (MLM) called Nauka. The launch of Nauka is scheduled for sometime in 2017 after many years of delays. Kelly’s get ahead task was to finish routing cables to the future location of Pressurized Mating Adapter 3 (PMA-3). 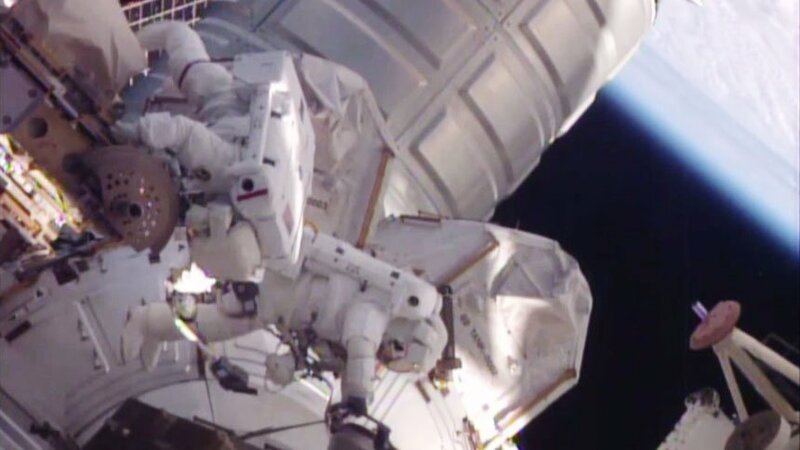 The cables were routed about halfway in an October 2015 EVA, but because of time constraints, the crew left them in a stored position at the Destiny laboratory module. Kelly finished routing the cables to the zenith Common Berthing Mechanism (CBM) on the Harmony node module. PMA-3 will eventually be relocated there sometime next year in preparation for the arrival of International Docking Adapter 3 (IDA-3), which will allow for Commercial Crew vehicles to dock to the station. After those tasks were finished, the crew returned to the airlock. Kopra entered first, then Kelly. Both connected their suits to ISS power and closed the hatch. The EVA concluded at 10:01 a.m. CST (16:01 GMT) when repressurization started. The spacewalk lasted a total of three hours and 16 minutes. This was the 191st spacewalk in support of space station assembly and maintenance, bringing total ISS spacewalk time to 1,195 hours. The next spacewalk is scheduled to occur sometime in the middle of January. That EVA will see Kopra and Timothy Peake replace the Sequential Shunt Unit, which caused one of the station’s eight power channels to go off-line. A Russian spacewalk is scheduled to be conducted by Sergey Volkov and Yuri Malenchenko sometime in February.